Malaysia is celebrating its 50 years of Independence. I m proud to be a Malaysian having borned and grew up all my life in Malaysia. Its a multi-cultural nation all supposedly to be living in harmony. Its never easy having to please so many races at any one time and uniting all of them becomes the single most important task of the nation. Its a constant struggle for non-Malays to work against the rules that are designed to favor the local Malay communities. While on the one hand the Malay-dominated government claims that its their job to ensure all communities are treated equally and fairly, its a known fact that non-Malays always have to work the extra mile to stay equal. With Globalization, Malaysia will need to work together regardless of their backgrounds and stay ahead. Malays are non-Malays, they have to be ready for the world stage and set their differences aside. With all the natural resources and the right people to manage those resources, I cant see why Malaysia will not be able to shine on the international stage having proven to create big brands like Air Asia and Petronas F1. 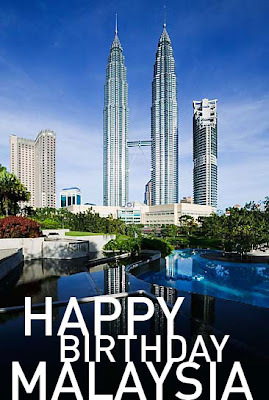 Malaysia will always be my special home and Happy Birthday to Malaysia and all fellow citizens of Malaysia and check out the best multi-lingual video clip below on Malaysia's 50th Independence.